Click each of the numbers to see more information. Click Back in your browser to return. 1. Tilt-Up Hood and Seat Deck. Provides quick and easy service accessibility for routine maintenance or adjustments. 2. Kohler Cast Iron Engines. 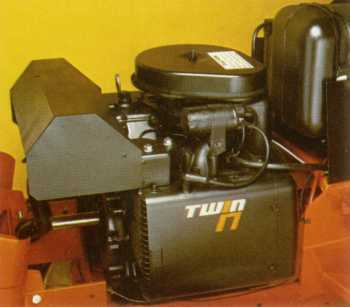 Horizontally opposed twin power with minimum vibration, uses less fuel than most single cylinder 17 and 19 hp engines, too. Result: load-lugging low end torque that minimizes power train strain, maximizes load carrying capacity, handles heavy loads without stalling, starts quickly in all kinds of weather. Air cooling, lightweight aluminum crankcase and Kohler "heart of iron" cast iron cylinder -cylinder engines deliver smooth barrels combine to lengthen engine life. Air cooled, single-cylinder cast iron Kohler engines are dynamically balanced, horizontally and vertically, to reduce vibration and enhance drive comfort. They deliver good fuel economy, high torque and smooth operation. Fast, positive starts are assured by compact magnet type starting motor and Kohler patented automatic compression release. 3. Controlled Traction. Limited slip differential automatically shifts power from wheel with less traction to the one with most - takes you over muddy, icy or slippery terrain with ease. 4. Two Transmissions. The 6-speed is all manual with 6 forward and 2 reverse speed ranges. The hydrostatic lets you choose speed and direction with one lever. You never have to clutch. All have belt power transfer to reduce shock. 5. "Live" Power Take-Off. The power takeoff is live so attachments can be operated with the tractor in gear or in neutral. The combination mechanical cone clutch provides power to all attachments - front, center or rear - without the need for costly conversion kits or separate engines. Makes for easy mounting and removal of attachments. 6. Spring Suspended Seat. High back, deep bucket design conforms to torso providing support and comfort. Springs located between seat and tractor soak up bumps and vibration. 7. Tough Full Length Frame. Engine and power train are cradled in heavy-duty full-length steel frame to maintain critical parts alignment through season after season of service. 9. 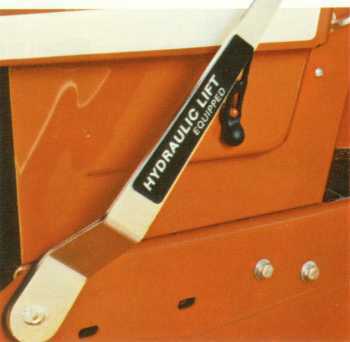 Hydraulic Implement Lift. Provides infinitely variable height control for attachments at a touch -- saves time, saves muscles, too! Standard on 916, 917 and 919 models. 8. 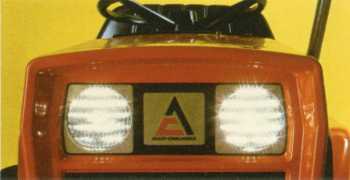 Built-in Headlights. Standard on all models. Let you mow or clear snow well after dark. Large reflectors put light where you need it. 10. Convenient Controls. 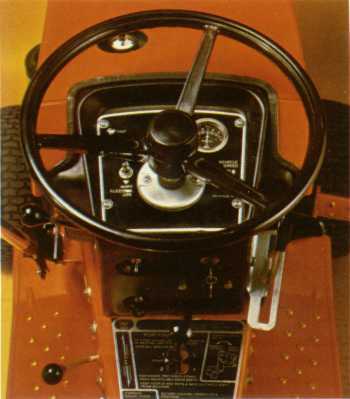 All controls are within easy reach and sight of the operator. Yet all levers are out of the way. You can get off the tractor with ease. 11. Easy Access Fuel Tank. Top of the hood location makes it easy to get at and read from the operators seat. Three gallon tank has large opening so you can refill easily without spilling. 12. Park-and-Lock Latch. 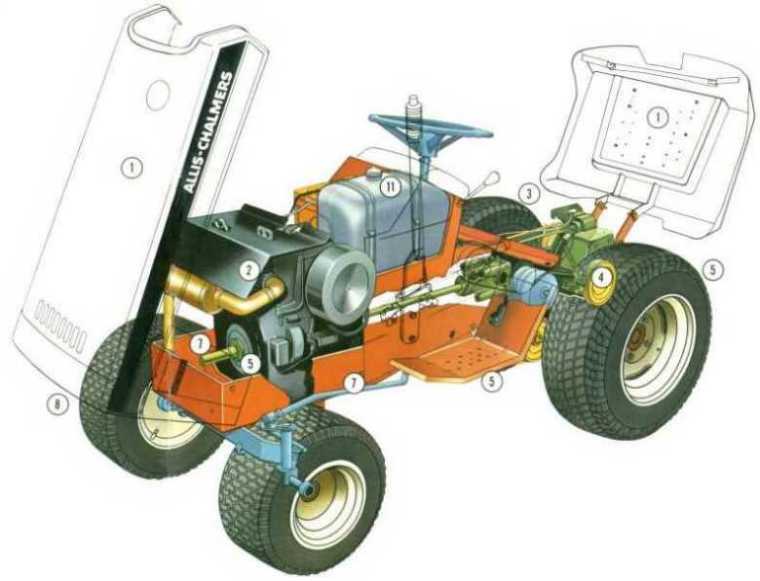 A security feature that locks your tractor firmly in place. A touch on the latch at the rear of the right foot rest does it - and release is just as simple. 13. In-Line Drive. Bevel gear box, engine and crankshaft are permanently aligned, assuring maximum power transfer from engine to transmission. Rubber isolator in drive shaft and belt power transfer dampen shock loads between gear box and transmission for smoother operation, less vibration. 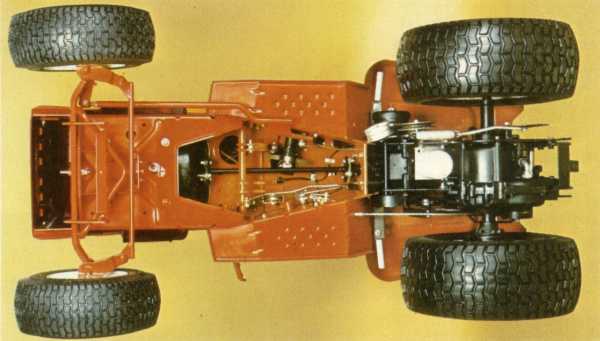 Shown is a 917H with OEM early style power steering option. Rims in this photo are non-original AGCO Pearl Grey in color. 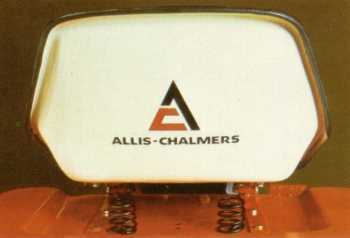 An RBT sicklebar is retrofitted to this machine with minor modifications from the original Allis 700 series application.